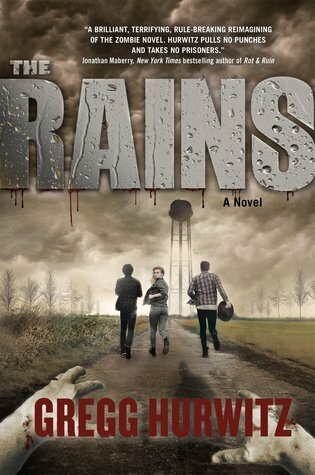 Here’s the deal: if you’re a fan of zombie stories or if a zombie origin tale that puts a fresh spin on the genre sounds like it might interest you, then you’re going to want to check out The Rains by Gregg Hurwitz. Double bonus for you too if you prefer books with a YA bent, as this is the author’s first book in a new series targeting teen readers. However, if you happen to be a science/biology geek or a stickler for common sense and logic, then this book is going to make you cry. The story begins with an introduction to the quiet and rural community of Creek’s Cause, where the peace is shattered one evening by a meteor strike. Not long afterwards, our fifteen-year-old protagonist Chance Rain and his older brother Patrick are awakened in the middle of the night by a commotion at their neighbors’ house, leading the two of them to sneak out and investigate. They arrive just in time to stop an attack on the kids by the stepmother, who appears to have been transformed into mindless raving husk by a mysterious and unknown parasite. After saving the children, Chance and Patrick find the father on top of a water tower where millions of alien spores look to have exploded from out of his bloated corpse. Recalling what he’s learned about the Cordyceps fungus and “zombie ants”, Chance quickly deduces that these spores are what’s causing the infection, turning all of the adults—and only adults, it seems—into violent, savage hosts. But if this is indeed the way the parasite is spreading, then why aren’t those who are younger being infected? Chance and Patrick find the answer to this once they arrive at the high school, where their science teacher Dr. Chatterjee has been sheltering the town’s children and teenagers. Chatterjee explains that the parasite appears to be affecting white matter, the paler tissue of the human brain mostly made up of nerve fibers and their myelin sheaths. And since the brains of children are not as developed as an adult’s and do not have as much white matter, they are immune to the effects of the spore. This also explains why Dr. Chatterjee, who has multiple sclerosis—a demyelinating disease—is unaffected himself. So far, this is going great. Things are getting pretty interesting. I’m liking the suspense, and the mystery behind the infectious agent is really driving things. But then, we get another bombshell. The group figures out that, at the exact moment a person turns 18, the brain will immediately become susceptible to the parasite. The exact moment. As in, right down to the minute of your birth. One second, you’re fine. But as soon as the clock ticks over, then happy birthday, you’re a zombie! The bio nerd in me just wants to tear my hair out and scream, NOOOOOOO THAT’S NOT HOW THIS WORKS! I do love it when zombie books use science to explain things (the Cordyceps idea is becoming a lot more common, for example, and I still can’t get enough) but let’s please try to make it more convincing. I thought that tying the parasite’s processes to brain development was ambitious and intriguing, but unfortunately the human body does not work like a clock. One does not wake up in the morning of their eighteenth birthday to find their brain suddenly and miraculously bursting with myelin. If only growing up and becoming mature was so easy. So yes, that bothered me a lot. It might even have biased me against the rest of the book. If such a glaring oversight made it through the first few drafts, I can only assume that the prevailing attitude was “This is YA, good science and reasoning won’t matter so much.” But it does. It should. With this in mind, I soon started seeing more plot holes, inaccuracies, and logical leaps. If things like that don’t concern you so much, then you should be fine, though for me they ultimately prevented me from calling The Rains a great book. It’s a shame too, because the plot was entertaining and fun in a way that reminded me a lot of The Faculty movie, and the characters were good, strong, and charming in the salt-of-the-earth sense. Still, generally speaking I don’t feel comfortable enough about recommending this book to just anyone; perhaps if you are a diehard zombie fiction reader or YA horror fan, you might want to take a look. However, if you’re a pickier reader like me who also predominantly reads adult speculative fiction, you might end up finding the flaws too distracting. I give this one 3 stars, and just barely. I used to read a ton of YA paranormal but the tropes and science like in this book put me off reading them! I love my zombies and I like the teacher having MS as a change but I don’t think I’ll be reading this one as priority! Haha, it was what I was thinking as I read this scene about a character changing on the spot, at very moment they were talking about. Everything was going great until that point, when the story lost all credibility with me 😛 But it was fun while it lasted! I agree, though too many publishers/editors still think it’s okay to skimp on detail or gloss over science just to pump out quantity over quality. I have a problem with books that don’t pass muster in the logic department, they may be fun to read but I can’t rate them or recommend them as highly. Ooh, I loved The Faculty. I’m a bio nerd, but it sounds like this might be worth a shot anyway. Implausible plot points – nothing gets my teeth on edge more and the whole idea of a time clock in your brain! I’ve read other books that had similar inventions. Sometimes, it’s best not to have too much of an explanation that you can pick at! I liked this one a lot but I totally agree- the turn eighteen-bam-you’re a zombie thing was ridiculous. And it’s a shame because I was loving this book and how creepy it was! I had to compartmentalize that whole thing and just keep going because I thought surely you can do better than that??? lol.